Make a great first impression when visitors come to your home by changing the door hardware. 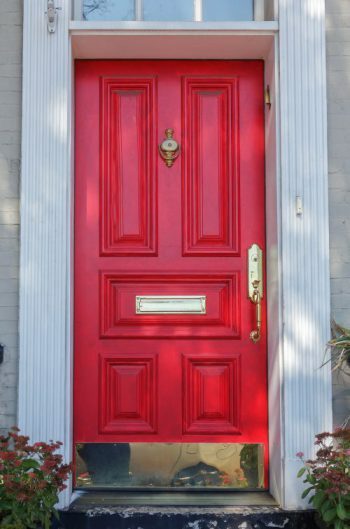 A few simple upgrades can turn a plain front door into a show stopper. Start with a new door set. Entry door sets come in an array of styles from Victorian and Renaissance Collection sets to Classic New York to Craftsman to elegant Windsor style, and many more. The knob choices include round, oval in smooth or ornate, as well as thumb grip and a number of styles of levers and handles. 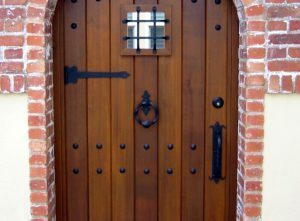 Door sets are available in solid brass, bronze, and iron and finishes to coordinate with any style including Rubbed Bronze, Medium Bronze, Dark Bronze, Antique Pewter, Antique Copper, Lifetime Brass, Polished Brass, Satin Nickel, and more. New Hinges will keep your door hanging straight and are available in a number of styles and finishes. Rust Straps add a stylish accent to Rustic, Colonial, Gothic, or Spanish style doors. Straps come in a number of sizes in iron, steel, bronze or solid brass. From Spearhead to Mediterranean to Fleur-de-Lis, Van Dykes has a huge selection of straps and hinges to complete any project. Straps are also a great accent on garden gates, garages, sheds, barn doors, and trunks. Kickplates are great for protecting the door from scuffing and add a finished look to the door. These beautiful and functional door accessories come in several sizes and an array of finishes. For a Medieval look add a Speakeasy Grille. These cage-like structures are a great safety feature allowing you to see who is at the door. Choose several models with a hinged door on the inside reminiscent of those used in the speakeasies of the 1920’s. Clavos are a special type of large nail with decorative head that adds a distinctive feature on doors, gates, trunks, and other projects. Clavos come in many styles including pyramid, round, cone head, star, Fleur-de-Lis, clover, and more. They also come in many finishes including Iron, Brass, Copper, and Pewter. Originating from ancient times, clavos were employed to decorate a wide variety of wooden objects, from temple doors to ships, carts and furniture. Another upgrade to the front door i s a new Door Bell or Door Knocker. 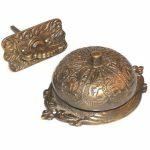 Van Dyke’s has over 40 styles of door bells including vintage Twist Mechanical Door bells and traditional door bells in various shapes and styles. Door Knockers add a distinctive design element to any door as well as provide a functional way to announce guests. Choose from traditional urn-shaped knockers to a more rustic iron ring knocker with rope ring. Van Dyke’s has a door knocker to suit any taste including several lion’s head models. Complete the look of your door with a brass mail slot. Interior door sets, like entry door sets, come in a wide array of styles and finishes from Rustic to Contemporary and simple to ornate. Door knob choices include lever, round, oval, octagonal, Prairie, New York, Victorian, Mission, Arts and Craft, Art Deco, and more. Backplates also are available in many styles and shapes. Push/Pull handles are a great for adding a beautiful and functional means of opening large interior doors and double doors. They come in many sizes and styles to suit any decor. Interior door sets come in four basic functions – privacy, passage, single dummy and double dummy. Privacy door sets can be locked from the inside and locked from the outside by emergency key and are used primarily in bedrooms and bathrooms, and any room that requires a locking mechanism. Passage doors sets are operational from both sides and have a latch, but no locking function. 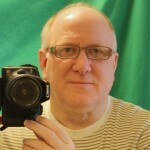 They are popular for use on closets and hallway doors. Dummy doors sets have no mechanical latch mechanism or lock. They are typically flush mounted with no mortise or hole cut in the door, but can be mounted on doors with predrilled holes. They are often used for closets, pantries, on interior double doors, and for decorative applications. Single dummy sets come with one knob, while double dummy sets have knobs for both sides. A few changes can give your door a new look and make the door more functional.